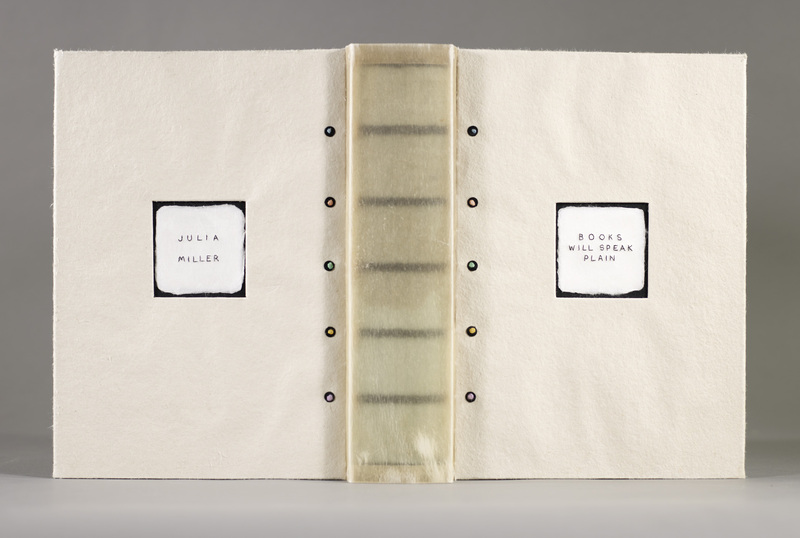 Non-adhesive dos rapporté book structure, sewn on cords and blue Japanese paper concertina using black linen thread, translucent vellum spine and Iowa paper board covers and endsheets, title and author embroidered on handmade Japanese paper, black parchment and linen thread decoration. Drop spine box with integral cradle covered in bookcloth and Iowa paper. Elaine Nishizu lives and works in Los Angeles, California. She has studied bookbinding at the American Academy of Bookbinding, centro del bel libro, various workshops and with Eleanore Ramsey.